Can I Play Lotomania Online? Read Reviews! Brazil – the land of Ronaldo, Ronaldinho, the carnival and Lotomania! This lottery is quite different from what you probably expect when you think about a lottery. If you’re used to 6/49 or 5/35 lotteries, you’ll need to forget about those! Lotomania is a 50/100 lottery. Have we got your interest now? Let’s take a deeper look at the game and everything that it entails. Lotomania is one of the games in the portfolio of Caixa – a Brazilian bank that offers a range of services, including lottery games. The game was first launched in 1999 and it’s been quite popular among Brazilians ever since. One of the reasons why it has managed to maintain a stellar reputation is the fact that Lotomania ranks among the games in Brazil that produce the biggest prizes. The drawings take place every Tuesday and Friday on national TV, at 8pm. National holidays are the only exceptions because special Lotomania drawings that feature much higher prizes are held on such occasions. 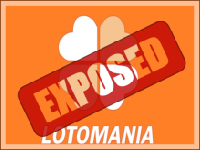 While Lotomania is a bit bizarre in comparison to what other national lotteries have to offer, we can assure you that it’s not a scam. As already mentioned, it’s been in the portfolio of Caixa Economica Federal ever since 1999. Caixa is a financial institution in the form of a public company. Still, it maintains its autonomy from the government and it’s been responsible for operating lotteries in the country ever since 1961. Currently, there are multiple games in the portfolio of Caixa. The most prominent ones include Mega Sena, Lotofacil, Quina, Timemania, Dupla Sena, Loteca, Federal and Lotogol. Lotteries are quite popular in Brazil. In 2007 alone, the funds generated through the sales of lottery tickets were 5.1 billion real. Caixa is dedicated to allocating some of these funds to good causes. During the very same year, 2.56 billion real were provided for the execution of social projects in the fields of sports development, education, culture and others. While the premise of Lotomania may seem confusing at first, the game isn’t that complicated. There are two drawings per week and tickets cost 1.5 real for a single entry. Players have to choose 50 numbers from a pool of 100. For a chance of winning the Lotomania jackpot, players have to match the 20 numbers drawn. A few additional prize tiers exist, as well. To win these prizes, players will have to match 19, 18, 17, 16, 15 or no numbers from the ones drawn. According to Caixa regulations, 45.3 percent of the funds generated through the sale of Lotomania tickets will be paid back in the form of prizes. The odds of winning the Lotomania jackpot are 1 in 11,372,635. While these aren’t the most favorable odds out there, the jackpots do justify the effort. Top prizes roll over in the case of no winner. The only exception is for specialized drawings like the ones held on Easter. These specialized drawings hand out the top prize, even if there’s no jackpot winner. The biggest jackpot in the history of Lotomania was 41.25 million real or approximately 12.49 US dollars. This jackpot fell on March 30, 2013. There were two lucky ticket owners who had gotten all 20 numbers correct. Each of these players took 20.626 million real home. A special jackpot is announced for festive drawing. The Easter Lotomania, for example, has a jackpot of 35 million real or 10.6 million US dollars. Other than the jackpot, there are 6 additional prize tiers. The second prize is handed to those who match 19 numbers. The prize represents 16 percent of the total award pool. Ten percent of the funds are distributed among the winners of the third prize tier. Keep in mind that while the lower prize tiers don’t feature such spectacular prizes like the jackpot, the odds of winning something improve significantly. The odds of getting 16 numbers correct, for example, are 1 in 472. Players have 90 days from the date of the drawing in order to make their prize claim. Keep in mind that Brazil has taxes on lottery prizes. Currently, there are proposals for the privatization of lotteries in the country. As of June 2017, there hasn’t been a decision about such a move yet. The government is interested in changing the structure in an attempt to double the funds collected in taxes. According to projections, through a privatization process the sum collected from lottery taxes will go from the current 1.9 billion US dollars to at least 3.8 billion. Thus, if you’re interested in Brazilian lotteries, you may want to keep an eye on the latest legislative changes. Can You Buy Lotomania Tickets Online? Foreigners who live in Brazil or are currently in the country can buy Lotomania tickets. Currently, there’s no online ticket buying option. Would you mind rating Lotomania? So, is Lotomania worth a try? Definitely! If you’re looking for something a bit more intriguing than the standard lottery, this one should definitely be on the list. If you’re in Brazil and you’ve already tried some of the country’s bigger lotteries, it may be time to give Lotomania a chance. A 50/100 lottery isn’t that common and the surprises and twists in this game will make lottery enthusiasts fall in love instantly. This is for when the usual format of games become boring.